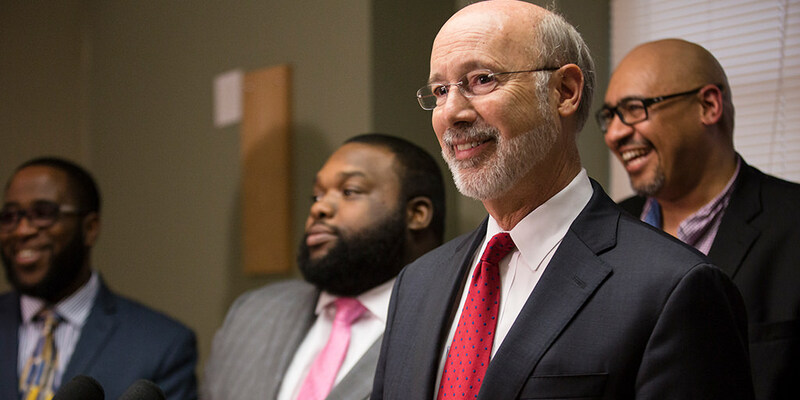 Harrisburg, PA – Governor Tom Wolf today announced a Fair-Chance hiring policy for state agencies that will remove the criminal conviction question, otherwise known as “banning the box,” from non-civil service employment applications for agencies under the governor’s jurisdiction. The governor, speaking alongside Representative Jordan Harris at a drug and alcohol recovery facility in Philadelphia, said the policy reaffirms the Wolf Administration’s commitment to reducing barriers for Pennsylvanians who seek the opportunity to work and contribute to their communities, and recognizes that everyone should have a meaningful chance to compete for jobs in the commonwealth. The new policy will be effective July 1, 2017 for non-civil service applicants. The Office of Administration will provide guidance and training to agencies prior to the implementation of the policy, and anticipates that the policy will be applied to civil service applicants by December 2017. Exceptions to the policy will be made for positions where a criminal conviction makes an applicant ineligible under law and for positions responsible for the safeguarding or security of people or property, law enforcement or those involving contact with vulnerable populations. Agencies are to continue to use the EEOC guidelines in determining whether an applicant’s criminal history affects their candidacy for the position they are seeking. To view the full policy, click here (pdf).